One of the most popular and useful features here at AFA is back for 2015. 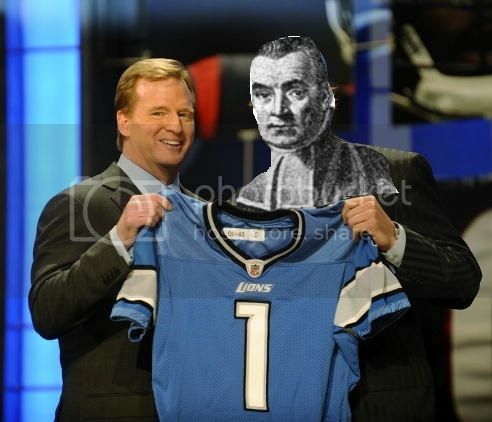 The Bayesian Draft Analysis Tool, codenamed 'Project War Room', predicts when a prospect will be taken at each point in the draft. And by extension, it tells GMs how likely a player will still be available at each pick. It's far more useful than just satisfying anxious fan curiosity. It allows team decision-makers the critical information they need to make sound trade decisions. If a GM has his eye set on a player, this tool let's him know how high he'll need to trade up (or how low he can risk trading down) to be reasonably assured the player will be available. In a nutshell, the tool combines information from a consensus of overall player grades plus expert projections of when each prospect will be drafted in a novel way. The Bayesian process allows various inputs to be combined to produce a probability distribution of selection at each pick number for each player. This approach means that the weight given to each input is only as strong as that input has been accurate in the past. Details on how the tool and its underlying model work can be found at these posts. The lower chart is the bottom line. It's the take-away. 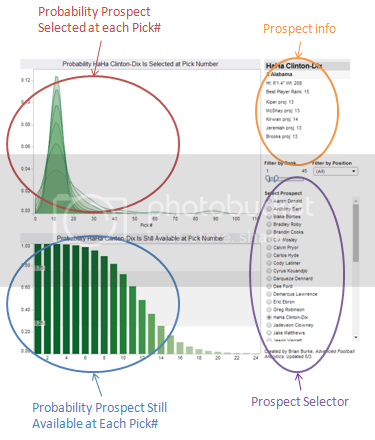 It depicts the cumulative probability that the selected prospect will remain available at each pick #. For example, currently there's an 82% chance the selected player below is available at the #8 pick but only a 26% chance he's available at #14. This is the result that allows a GM to know where he might need to position his team to nab his man. The second tab, titled "By Pick," might be more interesting to fans of specific teams rather than to draftniks. It shows the estimated probability of availability at each pick number (through the first two rounds). For example, if you're a Browns fan, you'll see how likely each prospect will be available at pick numbers 12, 19, and 43. For now I only have included projections from Mel Kiper and Todd McShay, but the 'priors' include several more rankings. I'll add more mock draft projections as we near draft day. In the upcoming days, there will be major improvements to how the underlying model works. It will include more information to provide an even better estimate of player availability. The Bayesian War Room Tool can be found under the site's Tools menu, and the direct link is here.